Keep Muscles Full & Pumped Around The Clock!Keep Muscles Full & Pumped Around The Clock! Agmatine is a byproduct of the amino acid arginine, but goes well beyond arginine in terms of benefits. Agmatine works through stimulating the release of pituitary hormones, including Luteinizing Hormone (LH) and Growth Hormone (GH). Agmatine has a variety of benefits, and can be beneficial and desirable for athletes and bodybuilders as well as fitness enthusiasts and people in search of a healthier lifestyle as they age. 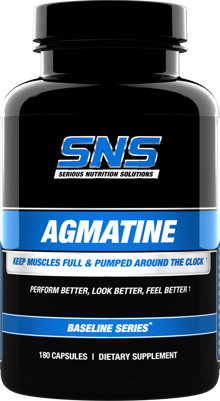 Agmatine also stimulates the release of Nitric Oxide by acting on the Nitric Oxide Synthases.